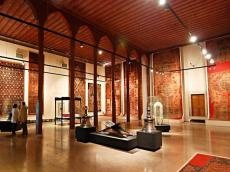 The exhibition of Islamic art of the Turkic world will open at the Museum and Exhibition Complex of the Azerbaijan State Academy of Arts on April 17-22. More than eighty samples of fine and decorative art from the exhibition collection of the municipality of Bursa, Turkey. The event is organized with the assistance of the Azerbaijan Ministry of Culture and Tourism and the Turkish Embassy in Azerbaijan. One can tell about ancient Turkish painting by the numerous manuscripts decorated with miniatures, and works differing in harmony and color of the image. Turkish applied art is represented by a variety of ceramic and porcelain artifacts, wooden carvings, metal products. The works are decorated with various plant motifs. Turkish red fabrics with a silver or gold pattern are traditional. Turkish carpets and prayer rig mats are characterized by restrained flavor and striking design.